Marketers can no longer afford to undervalue Generation Z. At an estimated 60 million, they make up 25.9 percent of the U.S. population. And while they have a reported $44 billion in buying power alone, when you factor in their influence on parent and home purchases, their real spending power is closer to $200 billion. Who are they? Gen Z includes those born in the mid 1990s to the early 2000s. In other words, Gen Zers are today’s teenagers and the fastest growing cohort of tomorrow’s trendsetters. Here’s what marketers should know if they want to be “in” with the cool kids. Gen Zers have never known a phone that wasn’t smart or an ad that wasn’t targeted. They know brands have more access to customer data, and in exchange, they expect highly personalized interactions. In Google’s report on Gen Z, 26 percent of teenage shoppers said they expect retailers to offer a more personalized experience based on their shopping habits and preferences. By comparison, only 22 percent of Millennials and 11 percent of Baby Boomers share that expectation. Gen Zers may crave hyper-personal experiences on social media, but they’re also keen to protect their privacy. They’re more inclined to cover the webcam on their laptops. Marketers need make sure they connect with Gen Zers on their own terms so that they don’t come across as creepy or too invasive. Less than one-third of teens say they are comfortable sharing personal details other than contact information and purchase history, according to IBM’s survey Uniquely Gen Z. But 61 percent would feel better sharing personal information with brands if they could trust it was being securely stored and protected. Though they prefer to keep private, Generation Z is offering more feedback than any other cohort. Almost half of Gen Z shoppers say that they give feedback often or very often. Most of the time they’re writing comments on retailer websites, but they’re also reviewing on Facebook, Twitter and Snapchat, so brands with strong social listening strategies will curry more follower favor. Having learned from previous generations that what goes on the internet stays on the internet (forever), Gen Zers prefer to browse as anonymous voyeurs. Apps such as Snapchat, Whisper, Yik Yak or Secret are popular among teens for their ephemerality and privacy. On sites like Twitter or Instagram, teens may use aliases or create separate accounts to maintain different social media personas. And where private channels are available, such as Instagram’s direct message option, teens will probably use it instead of publicly tagging friends. However, anonymity creates a challenge for brands trying to create personalized content for Gen Zers. 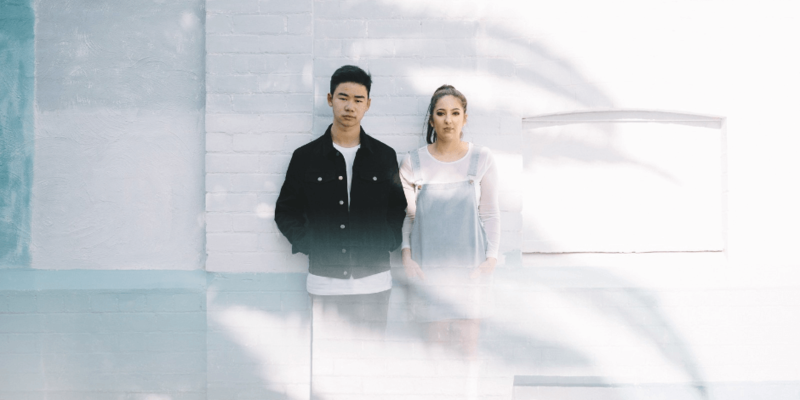 To develop accurate audience personas, brands should focus on private and direct channels to engage one-on-one with teenagers. Facebook Messenger has proven so effective for brands and users that Facebook is planning to spin-off a standalone Instagram messaging app called Direct. Market research shows that 85 percent of Generation Z learns about new products on social media and are also 59 percent more likely than older generations to connect with brands on social, too. Instagram is the most popular app for brand discovery, with 45 percent of teens using it to find cool new products, followed by Facebook, which comes in at 40 percent. Before making a purchase, Gen Zers are two times more likely than Millennials to turn to YouTube. YouTube is also the platform of preference when it comes to shopping recommendations, ranking first among Generation Z with 24 percent, followed by Instagram at 17 percent and Facebook at 16 percent. Meanwhile, in real brick-and-mortar stores, teens are most likely to turn to Snapchat to document their shopping experiences. Understanding how teens use social media throughout their shopping process is key to engaging them on the right platforms with the right message. As digital natives, Gen Zers have developed a high tolerance for digital ads. For example, even though 39 percent of teens think YouTube has too many ads, the video platform remains the most popular with this generation by far. 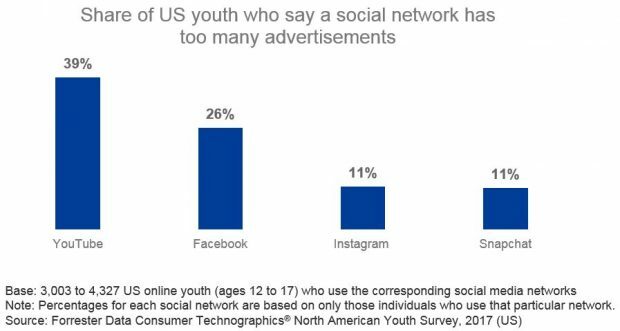 There’s even more room for brands to advertise on Instagram and Snapchat, where only 11 percent of teens think there are too many ads. That catch is that Gen Zers also tend to have way shorter attention spans. On average, marketers have about 8 seconds to reach a teen before they keep scrolling. So videos should deliver early impact and content should be packaged in bite-sized formats. Because of shorter attention spans, teens do not like non-skippable ad formats like pre-rolls and pop-ups. Perception flips to positive, however, when advertisers offer the option to play or not play an ad. And Gen Zers are the quickest to exercise that control, clicking skip on video ads after only 9.5 seconds, versus Gen Xers who wait 12.6 seconds. Likewise, when brands provide incentives for interaction, Gen Zers will actually opt-in: 41 percent show a positive reaction to mobile ads that offer rewards. The creators of trivia app HQ quickly realized that reciprocating engagement with perks comes with its own rewards in the form of 1.9 million users. 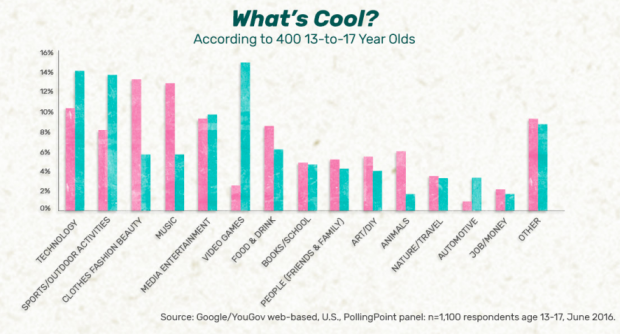 Teens aren’t only open to engaging with brands: they’re ready to engage with new concepts, too. In a poll by Accenture, 73 percent of Gen Z shoppers say they are currently using, can’t wait to try, or probably will try voice-activated ordering in the future. They’re also most enthusiastic about the potential of virtual reality. This openness to experimentation gives marketers opportunities to surprise and delight teens with creative campaigns and concepts. Live video, 360 video and other formats have proven popular with younger viewers. And anything that makes shopping seem easier or faster will have added appeal. For example, 71 percent of respondents aged 18-20 express interest in auto-replenishment programs. 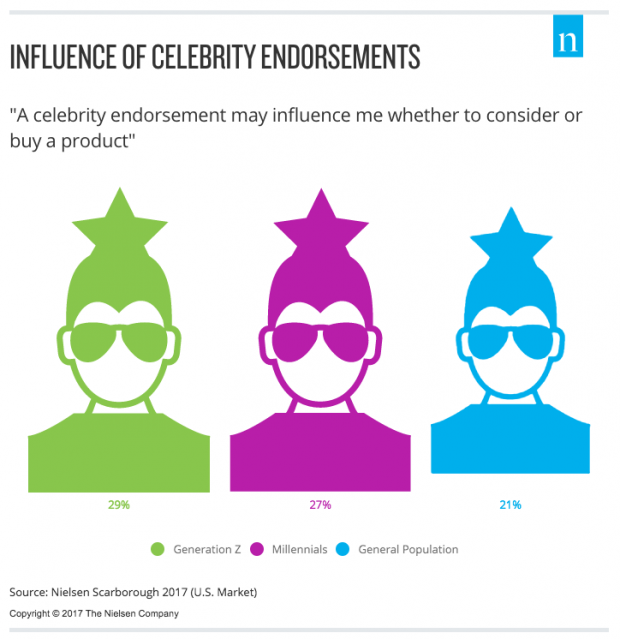 Celebrity endorsements are meaningful to teens, but they lose their luster if they don’t seem genuine or authentic. Likewise, teens expect a celebrity to be upfront with branded content and have a low tolerance for product placement. When asked about their most acceptable type of branded content 79 percent of Gen Zers thought a celebrity talking about why they like a brand was “always acceptable or sometimes OK.” Least acceptable is when a celeb shows a brand in a post but doesn’t say anything about it. And while nods from actors, athletes and musicians may bring star power to ad spots, there’s a new type of celebrity in town: internet stars, a.k.a. social influencers. Depending on the product, online celebrities can hold more sway with Gen Zers than more traditional celebrities. For example, internet stars outshine mainstream celebrities when it comes to beauty product and tech gadget endorsements. Only when it comes to clothes and accessories do mainstream celebs squeak by with 43 percent of influence, versus 41 percent for online influencers. For Gen Zers, RuPaul’s Drag Queens are role models, Teen Vogue is woke, and “girl bosses” are a done deal. For the most part, Generation Z welcomes diversity with open arms and expects marketers to do the same. Brands looking to tap the cultural zeitgeist should take note of backlash over controversies like Pepsi’s Kendall Jenner ad, or Dodge Ram’s Super Bowl spot featuring a Martin Luther King Jr. speech. It’s not always easy to get it right, and this socially active group is quick to let companies know when they’ve got it wrong (see point on “giving feedback” above). Brands should also keep in mind which platforms are more popular among males and females. Girls are significantly more likely to use Instagram, Facebook, Snapchat, Pinterest and Tumblr, according to a survey from AdWeek and Defy Media. On the other hand, Boys are more inclined to spend time on Twitch, TV, and Reddit. They are also 24 percent likelier than girls to state that they can’t live without YouTube. Then there’s the cool factor. Boys tend to measure the “coolness” of something based on fads and friends, whereas girls determine something is cool based on how it makes them feel. For Gen Zers, the outlook is bright. More than half of the cohort believes that they are going to be better off than their parents. That’s a stark uptick from earlier research that found only 27 percent of 2016 high school graduates felt the same way. Perhaps Generation Z has good reason to feel positive about the future, given that they’ve already proven they’re fiscally responsible. 85 percent agree that it’s important to save for the future. Only 37 percent describe themselves as spenders versus 63 percent who call themselves savers. Nonetheless they’ve embraced the Millennial YOLO mantra, prioritizing fun and experience over sacrifice. Their top three priorities include enjoying life, finding a great job, and becoming a better person. Older people, meanwhile, are more pessimistic about the future for Gen Zers. Among Baby Boomers, 54 percent think life will be worse for Generation Z. But as we’ve seen with events like Brexit or the 2016 U.S. election, there’s a growing gap between young and old when it comes to their future outlook. That age gap is something marketers should keep in mind, especially if it means that they could be underestimating the consumer confidence of this young and bullish generation. Connect with Generation Z using Hootsuite. From a single dashboard you can easily manage all your social channels, collect real-time data, and engage with your audience across networks. Try it free today.